The RH 12/140 can be used to install cased and non-cased piles, using the Kelly method. 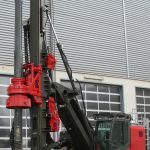 It is also possible to use the CFA auger system with this machine. The set-up / break-down times on the jobsite are short because the rotary head and the kelly bar can stay on the machine for transport.